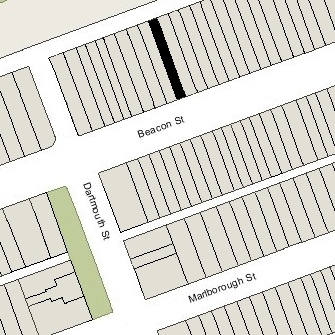 216 Beacon is located on the north side of Beacon, between Clarendon and Dartmouth, with 214 Beacon to the east and 218-220 Beacon to the west. 216 Beacon was built ca. 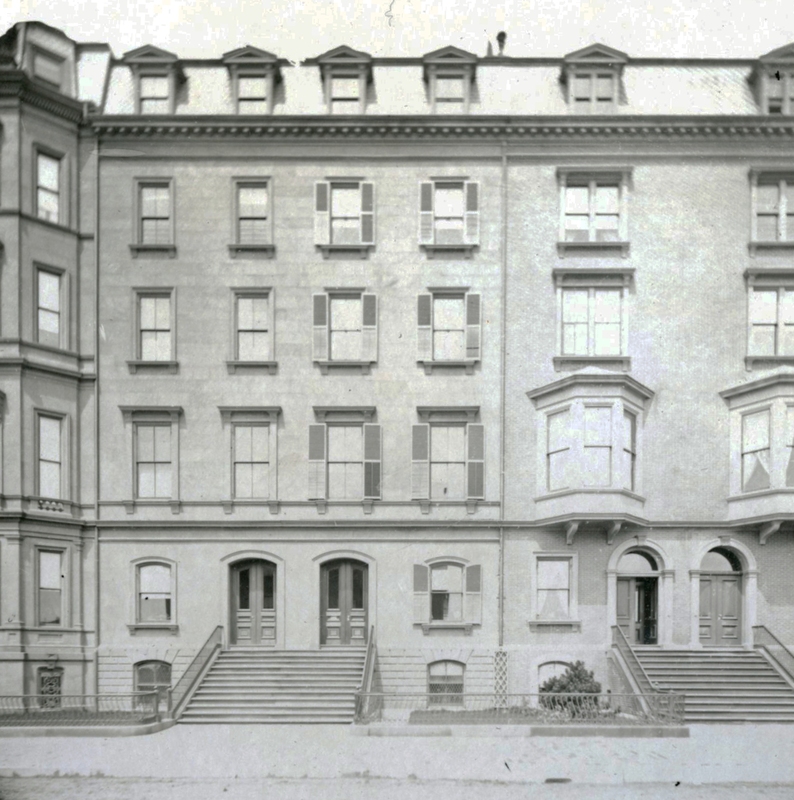 1863, one of a symmetrical pair of houses (214-216 Beacon), with 214 Beacon three feet wider than 216 Beacon. Each house originally had a one-story oriel. 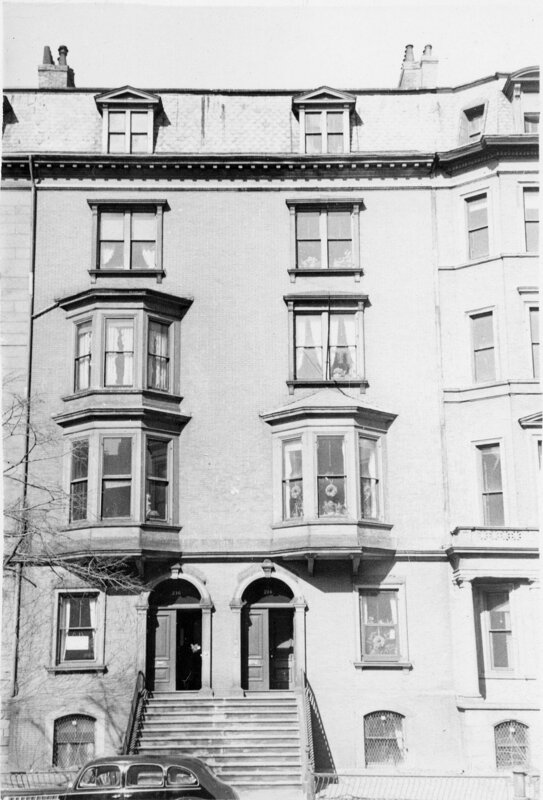 The oriel at 216 Beacon had been extended an additional story by the early 1940s; the oriel at 214 Beacon was extended an additional story in the mid-1980s. 216 Beacon was built as the home of the Cornelia Dehon, Susan O. Bicker Dehon, and Harriet (Harriette) Augusta Dehon, sisters. The land for the house was part of a 100 foot wide parcel purchased from the Boston and Roxbury Mill Corporation by their brother, attorney William Dehon, on June 13, 1862. On April 9, 1863, he transferred the lot for 216 Beacon to a trust established under the will of their brother, Theodore Dehon of New York City, for the benefit of his only child, Maria Haggerty Dehon. William Dehon and Theodore Dehon’s widow, Maria Louisa (Haggerty) Dehon, were the trustees. When he transferred the lot, William Dehon included language in the deed specifying that the rear façade of any house built at 216 Beacon was not to extend any further north than that of the house at 214 Beacon without the consent of the owner of 214 Beacon, and that the height of any stable built at the rear of 216 Beacon was to be no more than thirteen feet. Click here for an index to the deeds for 216 Beacon. On November 4, 1878, Maria Louisa (Haggerty) Dehon, the surviving trustee (William Dehon having died in May of 1875), transferred 216 Beacon to her daughter, Maria Haggerty Dehon, who had come of age. The house continued to be the home of Cornelia, Harriet, and Susan Dehon. Harriet Dehon married in December of 1878 to Maurice Delfosse, the Belgian Minister to the US, and probably moved to Washington DC. Cornelia and Susan Dehon continued to live at 216 Beacon during the 1882-1883 winter season, but then lived elsewhere for several years. By the 1883-1884 winter season, it was the home of Susan (Daland) Cox, the widow of Dr. Benjamin Cox, who had been a physician in Salem. Living with her was their son, Benjamin Francis Cox, who entered Harvard that year. They continued to live at 216 Beacon in 1885, but moved soon thereafter to a new home she had built at 285 Beacon. 216 Beacon was not listed in the 1886 Blue Book. By the 1886-1887 winter season, Cornelia and Susan Dehon were once again living at 216 Beacon. During the 1888-1889 winter season, Cornelia and Susan Dehon were living elsewhere, probably visiting their sister-in-law and niece in New York City, where Susan Dehon died in July of 1889. During the 1888-1889 season, 216 Beacon was the home of Captain Robert Bennet Forbes. He was a retired shipping merchant who had been engaged in the China trade. A widower, he had lived at 312 Marlborough earlier in 1888. He also maintained a home in Milton. By mid-1889, he had moved to 393 Beacon. By the 1889-1890 winter season, 216 Beacon was Cornelia Dehon’s home once again. She continued to live there until her death in September of 1904. The house was not listed in the 1905 Blue Book. On January 27, 1905, 216 Beacon was acquired from Maria Haggerty Dehon by Fanny Gore (Bradford) Cutler, the wife of Dr. Elbridge Gerry Cutler. The Cutlers lived at 214 Beacon, and appear to have purchased 216 Beacon as income property. By the 1905-1906 winter season, 216 Beacon was the home of Ellen Sturgis Hooper and her sister, Mary Hooper. They previously had lived at 49 Beacon with their father, Edward Hooper, who died in June of 1901. Mary Hooper married in August of 1906 to Roger Sherman Warner, a lawyer; after their marriage, they lived at 76 Mt. Vernon. Ellen Hooper married in September of 1908 to John Briggs Potter, an artist and Keeper of Paintings for the Museum of Fine Arts; after their marriage, they lived at 26 West Cedar. By the 1908-1909 winter season, 216 Beacon was the home of attorney Joseph Bangs Warner and his wife, Margaret (Storer) Warner, the parents of Mary (Hooper) Warner’s husband, Roger. They previously had lived in Cambridge. Joseph and Margaret Warner continued to live at 216 Beacon during the 1910-1911 winter season, but moved soon thereafter to 23 Brimmer. 216 Beacon was not listed in the 1912 Blue Book. By the 1912-1913 winter season, 216 Beacon was the home of real estate broker and investor Richards Merry Bradley and his wife Amy Owen (Aldis) Bradley. They previously had lived in Brookline. Amy Bradley died in December of 1918, and Richards Bradley continued to live at 216 Beacon with their five unmarried daughters: Amy Owen Bradley, Helen Aldis Bradley. Sarah Merry Bradley, Mary Townsend Bradley, and Edith Richards Bradley. They also maintained a home in Brattleboro, Vermont. Amy Bradley married in August of 1920 to Philip Hales Suter. They both had served in the American Ambulance Field Service in France during World War I. After their marriage, they lived in Milton. Sarah Bradley married in June of 1924 to Dr. Clarence James Gamble, a physician who later would become an international leader in family planning. After their marriage, they lived in Philadelphia. Helen Bradley married in January of 1925 to Charles Morgan Rotch, a stockbroker. After their marriage, they lived in Milton. Richards Bradley lived at 216 Beacon with Mary and Edith Bradley until about 1931, when they moved to Milton. Fanny Cutler died in October of 1932 and her daughter, Anna Williams Cutler, inherited both 214 Beacon and 216 Beacon. She lived at 214 Beacon. 216 Beacon was not listed in the 1932-1937 Blue Books. It was shown as vacant in the 1932-1938 City directories, and was not listed in the 1938-1942 City Directories. In the early 1940s, Anna Cutler began renting lodging units at 216 Beacon, and in March of 1949 she filed for (and subsequently received) permission to convert 216 Beacon to a lodging house. To facilitate the use, she installed fire balconies connecting with her home at 214 Beacon. Anna Cutler continued to live at 214 Beacon and own 216 Beacon until he death in December of 1969. On July 22, 1970, 214 Beacon and 216 Beacon were purchased from the Bradford family by Tobias R. Hanks and Michael J. Underhill. In August of 1970, they filed for (and subsequently received) permission to convert 216 Beacon from a lodging house into seven apartments. They subsequently reduced the number of units to six. 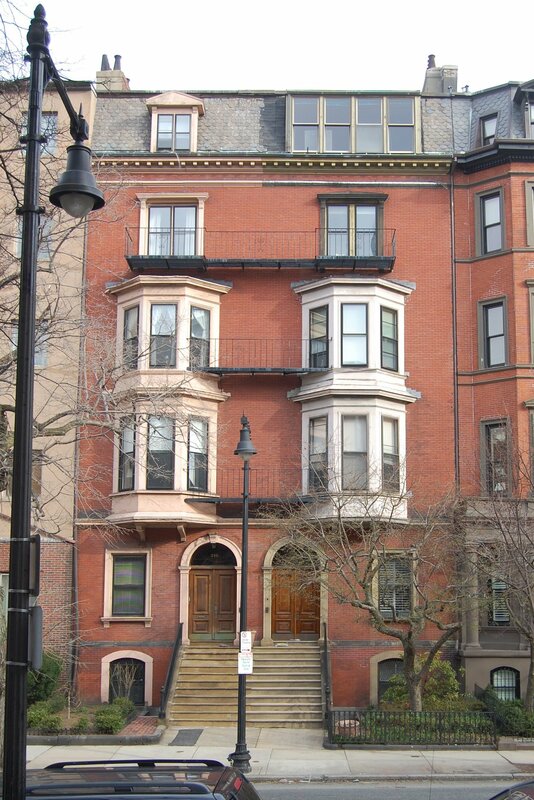 The property changed hands and on October 20, 1980, was purchased by Lee M. Kennedy, trustee of the 216 Beacon Street Trust. In March of 1981, he applied for (and subsequently received) permission to reduce the number of units from six to three. 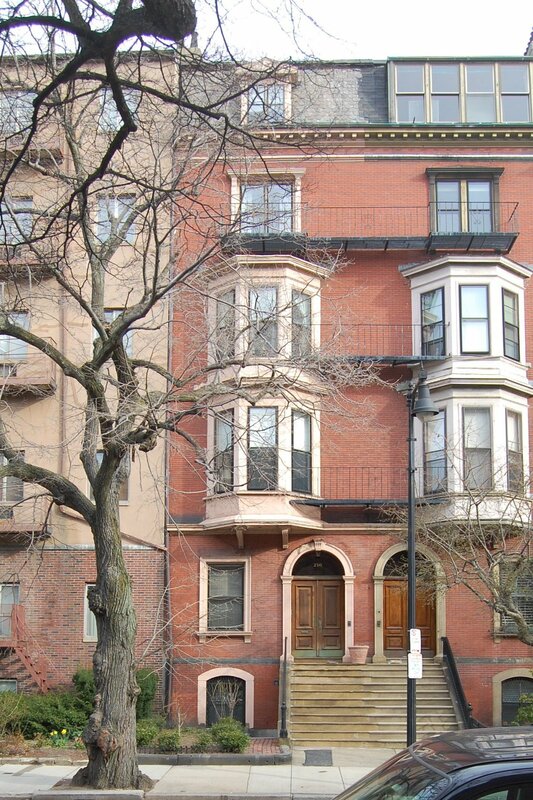 On December 2, 1981, Lee Kennedy converted the property into three condominium units, the 216 Beacon Street Condominium.